Dateline Soweto documents the working lives of black South African reporters caught between the mistrust of militant blacks, police harrassment, and white editors who—fearing government disapproval—may not print the stories these reporters risk their lives to get. 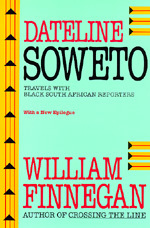 William Finnegan revisited several of these reporters during the May 1994 election and describes their post-apartheid working experience in a new preface and epilogue. William Finnegan is a staff writer at The New Yorker and the author of Crossing the Line: A Year in the Land of Apartheid and A Complicated War: The Harrowing of Mozambique, both published by California.